Its been a long day - YAWN! Katie is almost three years old. 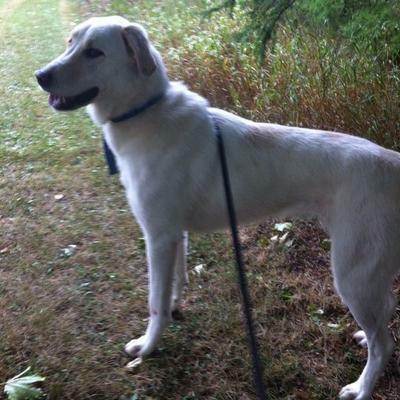 She is a Pyr-Lab mix living at a vet clinic in Fenelon Falls. She was surrendered because she and her brother teamed up to attack a cat. Although Katie does not exhibit aggressive behaviour towards cats at the clinic, she appears to have a strong prey drive so she cannot go to a home with cats. However, Katie is polite towards but relatively uninterested in dogs of all sizes. 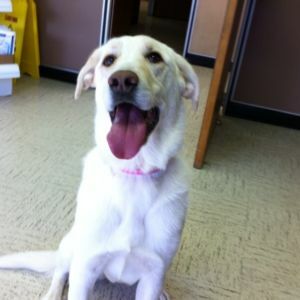 Katie is a very sweet dog and good with all the people in the clinic. She deserves a good home where she has her own humans. Katie is spayed and up to date on all vaccinations.